Alibaba Group Holding Limited is a Chinese multinational e-commerce, retail, Internet, AI and technology conglomerate founded in 1999 with a hugely successful e-commerce and on-line shopping business via web portals, as well as electronic payment services, shopping search engines and cloud computing services. The group owns and operates a diverse array of businesses around the world in numerous sectors, and is named as one of the world’s most admired companies by Fortune. Alibaba plans for a new digital free-trade zone in Thailand advocating global free trade. It would be Thailand’s third such free-trade zone. 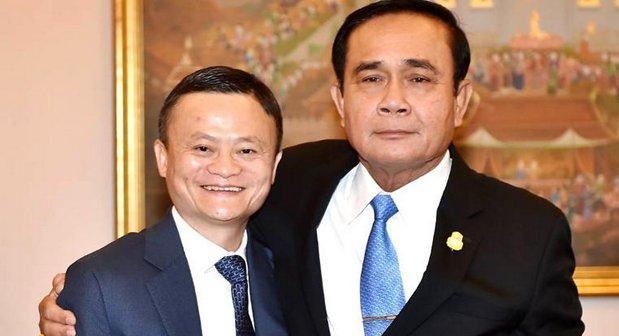 During his meeting in Thailand, Mr Ma met Thai Prime Minister Gen Prayut Chan-o-cha, Deputy Prime Minister Somkid Jatusripitak and the rest of the Thai government’s economic team to discuss their future cooperation and the group's investments in the country. The Chinese e-commerce giant agreed to help SMEs, startups and farmers in Thailand by getting them more digitally connected through its platforms. Alibaba Group’s investment in Thailand’s EEC zone will facilitate increased agricultural exports from Thailand to China. Also speaking at the event, Deputy PM Somkid said the Chinese e-commerce giant’s latest foray in Thailand would be a major shot in the arm for the country’s US$45bn eastern economic corridor. The Thai government has said it hopes the vast project will help lift annual economic growth to 5% by 2020 from its 2017 growth rate of 3.9%. 4. Alibaba's 11 billion baht investment in a smart digital hub in the EEC. “China is on its way to becoming the world’s largest consumer, driven by rising income and a growing middle class of 300 million. There is no better time than now for trade-oriented countries to seize this opportunity to export to China as the country continues to open its doors wider for global trade,” Mr Ma said after the meeting. “Quality Thai agricultural products such as fragrant rice, durian and other tropical fruits in particular are sought after by the Chinese consumer,” he said. “Given Thailand’s unique strengths in people and culture, we are confident of its future and growth potential. “We are committed to being a long-term partner of Thailand to help enable its digital transformation,” the Alibaba co-founder added. Gen Prayut said cooperation with the Alibaba Group will enhance the country’s e-commerce development and would be good for growth. “The group believes Thailand has the potential to become an e-commerce centre in the region, which conforms to government policy. This also helps to develop the economies of neighbouring countries,” he said. “This cooperation will assist local community businesses and help farmers increase their income as logistics will be much improved and farm products can will able to be shipped within 24 hours,” Gen Prayut noted. Mr Somkid said Alibaba’s investment in the smart digital hub will be an important platform to link Thai SMEs, Otop (One Tambon, One Product) items and farm products to China and the global market. The EEC Office signed two of the four MoUs yesterday (April 19), according to Kanit Sangsubhan, the agency’s secretary-general. The first MoU covers cooperation with Alibaba’s e-commerce subsidiary in Singapore to drive exports of Thai farm products and other goods to the global market, starting with rice and durian. The Commerce Ministry expects up to 45,000 tons of high-quality rice will be exported via e-commerce channels this year, rising to 120,000 tons in 2019. The second MoU was signed with Alibaba Group’s Cainiao Smart Logistics Network Hong Kong Ltd and focuses on the smart digital hub in the EEC. “The cooperation will open a great opportunity for Thailand and enhance trading in Cambodia, Laos, Vietnam and Cambodia,” Mr Kanit said. The final MoU was between Alibaba Business School and two Thai authorities – the Industrial Promotion Department and the International Trade Promotion Department – to help develop more suitable human resources for SMEs including “smart” farmers. With all due respect, & although Jack is probably a good bloke;The belt and road is a political scheme, to cover the growth of China’s political control over its neighbours. Actual construction is very small. China, meanwhile, is continuing to build and militarize artificial islands in the South China Sea.